Focused with the warmth of wood and a buttery rimshot. Also available in a 5.5x14 variant. Payments as low as $47/mo. 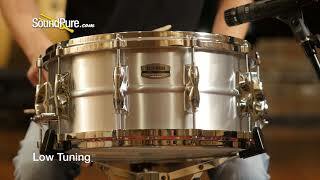 Yamaha’s Recording Custom Aluminum snare drum offers the classic crispness of aluminum at a player’s price point. The thin 1.2mm allows the drum to fully and warmly resonate, while the 3mm hoops add a degree of focus, resulting in an open yet articulate tone. Perfectly suited for jazz and classic rock, this snare provides gigging drummers with an affordable and versatile workhorse. In this video, Sound Pure percussion specialist Barry Knain explains the various features of the Yamaha 6.5x14 Recording Custom Aluminum Snare Drum, and tests it out in several different tuning ranges.